The Genève has been known as an affordable, yet high-quality dress watch since its introduction in the 1960s. Today, this timepiece serves as a perfect entry point into the vintage world of this Swiss luxury watch brand. Omega originally applied the term ' Genève' to particularly high-quality watches that had at least 50% of their construction completed in Geneva. As models like the Speedmaster and Seamaster grew in popularity in the 1960s, the Biel-based luxury watch manufacturer decided to turn the Genève into its own collection of entry-level watches. 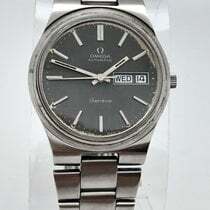 Omega produced the collection until the early 1980s. Many different models were released over the Genève's lifespan, some of which were truly unique. The collection included watches with oval, rectangular, and barrel-shaped cases in gold or stainless steel. Each timepiece featured a manual, automatic, or quartz movement , with or without a date display. Though their average diameter of 35 mm is rather small by modern standards, back then it was seen as more than sufficient. Simple, three-hand designs unite this collection of perfect dress watches. Thin line indices keep the dials looking tidy. Many models also feature sunburst dial patterns. Take caution when wearing this timepiece to the beach or pool: It is only water resistant to 30 m (3 bar, 98 ft) and, therefore, needs to be protected against moisture. Perhaps most importantly, these timepieces are an affordable entry point into vintage Omega watches . 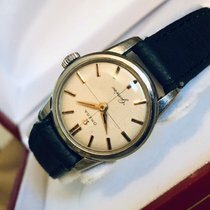 How much does an Omega Genève cost? The Genève collection offers a vast selection of models. Prices depend on the watch's material, features, and size. You can purchase a 20-mm women's model in stainless steel with a manual caliber and no date for as little as 290 USD. At around 400 USD, gold-plated models with a date and diameter of 22.5 mm are only slightly more expensive. Men's models begin around 580 USD. At this price, you can get a manual, 33-mm watch in stainless steel without a date display. If you'd prefer a date, your options include both manual and automatic watches. Most of these watches have larger diameters of 34 to 36 mm and prices ranging from 690 to 870 USD. Top models in this series are made of yellow, red, or white gold. A 33-mm Genève with an automatic caliber and a date display costs around 1,200 USD. Models with a day-date display and a solid gold bracelet can easily cost double that. 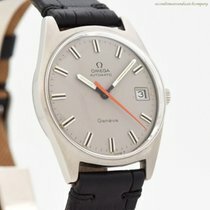 In the early 70s, Omega began outfitting the Genève with quartz movements. 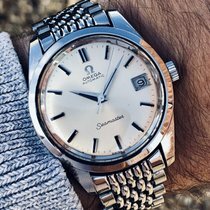 These models are easy to recognize thanks to the "Electronic" or "Megaquartz" inscription on the dial and the Omega logo against a red background at 12 o'clock. These watches measure almost 39 mm in diameter, feature a date or day-date display, and demand prices ranging from 580 to 810 USD. The Dynamic and Chronostop look very different than fellow Genève models. The Dynamic, in particular, catches the eye with its shape: The oval stainless steel case is much wider than it is tall and almost functions as a shield, stretching out past the lugs. The band, available in stainless steel or leather, tapers toward the clasp, underscoring the overall sporty yet elegant design. The dials also feel sporty, especially on the multicolored models. You can purchase a 29-mm women's Dynamic for as little as 350 USD, regardless of the movement type. You'll need another 90 USD on hand for a well-maintained example with a date display. At 41 mm, the men's version of the Dynamic is much more conspicuous. Its price also sits well above that of the women's editions, coming in at around 690 USD. That amount will get you an automatic watch with a day-date display. The Chronostop has an even sportier appearance. It is the series' only chronograph. 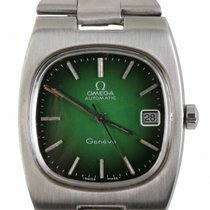 However, Omega remained consistent to the collection's three-hand design, completely foregoing any subdials. The stopwatch function is operated using a push-piece at 2 o'clock. The crown, in turn, has slid down to the 4 o'clock position. This 35-mm watch is powered by one of two manual calibers: either the 920 (date) or the 865 (no date). Plan to spend between 920 and 1,400 USD on one of these collector's items.